We have been trusted by the Green Bay Packers on five separate occasions to handle work at their legendary home, Lambeau Field. We also have handled projects for casinos, hotels and exposition halls, among others. Our goal is to effectively mesh functionality and affordability with the impactful look and feel you desire. The Fox Cities Exhibition Center is a destination venue in downtown Appleton, Wis., designed to hold conventions, trade shows, special events and entertainment functions. Ten area communities came together to help fund the new, $31.9-million facility, which was completed over a 16-month time period starting late in 2016. Hyatt Hotels Corporation is a multi-national hospitality company that has nearly 800 hotel/resort/vacation properties in 54 countries. Its Hyatt Place brand consists of mid-sized hotels which cater to families. The Courtyard Marriott Appleton Riverfront is a four-story, 97-room hotel along the banks of the Fox River in Appleton, Wis. The $12-million property is on the north end of the RiverHeath District, a commercial/residential mixed-use development that also includes townhouses, apartments, retailers, small businesses, offices, restaurants and a coffee shop. The Hotel Northland is a restored 1920s-era hotel located in downtown Green Bay. First opened in March 1924 as the largest hotel in the state, today its building is listed on the Wisconsin State Register of Historic Places. The Egg Harbor Library and Community Center is a hub for residents and visitors of this small village in Door County, a popular vacation and tourist destination in Northeast Wisconsin. With significant underwriting by area philanthropists Donald and Carol Kress, what originally was conceived as simply a new library location ultimately became a multi-faceted facility for community meetings, activities and events. The Gordon Bubolz Nature Preserve serves Northeast Wisconsin through its mission of teaching environmental ethics through education, recreation and conservation while promoting an appreciation of nature. First opened in 1981, it plays host to approximately 6,000 school children on field trips each year, along with nature enthusiasts of all ages. The Edgewater Hotel is an AAA Four Diamond property along the shores of Lake Mendota, one of Wisconsin’s largest inland lakes. Located in Madison, Wis., the 202-room property sits just blocks from the state capital and the state’s flagship university. The Alliant Energy Center is a multi-venue complex of four unique and versatile venues located in Wisconsin's capital city of Madison, hosting events that include expositions, conventions, meetings, concerts and sporting competitions. Catholic Youth Expeditions is a non-profit organization dedicated to fostering the Catholic Christian community through expedition retreats of prayer, Gospel proclamation and outdoor adventure. Its “outdoor ministry” for high school and college students occurs at Saint Joseph Formation Center (SJFC) in Baileys Harbor, Wis., along the shores of Kangaroo Lake in picturesque Door County. In moving the restaurant inside the Lambeau Field Atrium down to ground level, replacing a 12-year old eatery on the second floor, the Green Bay Packers desired an entirely new brand and atmosphere. The ultimate goal was to make it inviting for year-round guests to the iconic football stadium, not just those visiting on game days, and to appeal to local residents. A four-story Fairfield Inn and Suites hotel overlooking the bluffs of Decorah, Iowa, a town of less than 10,000 residents in the northeast corner of the state, went up over a 15-month period. 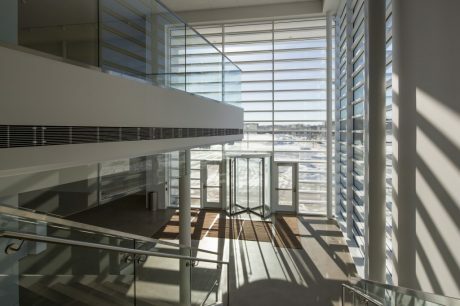 In April 2013 the Museum of Wisconsin Art (MOWA) opened a brand-new, 31,000-square-foot building, designed and built with a triangular layout. HJ Martin's Commercial Doors and Hardware division installed custom hollow metal frames and painted doors with DORMA hardware and FSB hardware from Germany throughout the museum. The Commercial Glass Division of H.J. Martin worked on the approximately 5,100 square feet of windows on the structure. Since opening, MOWA has proudly received several awards for its unique and modern architecture. HJ Martin's experienced installers helped to complete expansive rubber floors, pattern in VCT, carpet, LVT, and vinyl base. All work was completed with extensive efforts to reduce dust and noise. Open communication, clean/thorough installers, and a high degree of manpower ensured the project was completed well within schedule. HJ Martin completed 115 bathrooms for the Comfort Suites, 29 of which had high-end rain showers. The Schluter® System was used to build the showers, helping them to maintain durability and integrity. All showers have porcelain tile and waterproof TVs. This job was completed one wing at a time, allowing the Comfort Suites to remain in operation. HJ Martin helped to install many different types of flooring including ceramic tile, carpet tile, linoleum, rubber tile, and vinyl tile in common areas, an indoor pool location and more. Experienced installers in resilient materials ensure that the flooring at the Kroc Community Center will stand up to the test of time despite high traffic and normal wear and tear. HJ Martin completed the Potawatomi Bingo & Casino project, having installed a variety of curved ceilings and domes. The Walls & Ceilings division played an integral role in several areas that were build outs for restaurants in addition to the main gaming floor. After a year long project, HJ Martin's focus on high-end specialty finishes resulted in a 2009 Build Wisconsin award as specialty contractor for interior finishes.